The data volume in every company is growing exponentially: This requires a high, future-proof scalability in terms of both data volume and speed. IT landscapes are actually characterized by a variety of structured and unstructured data sources. As one of the leading technology providers for cognitive search and analysis, SINEQUA makes it possible to obtain valuable information from very large and complex data sets. In “information-driven” companies, employees constantly need relevant information for their work. 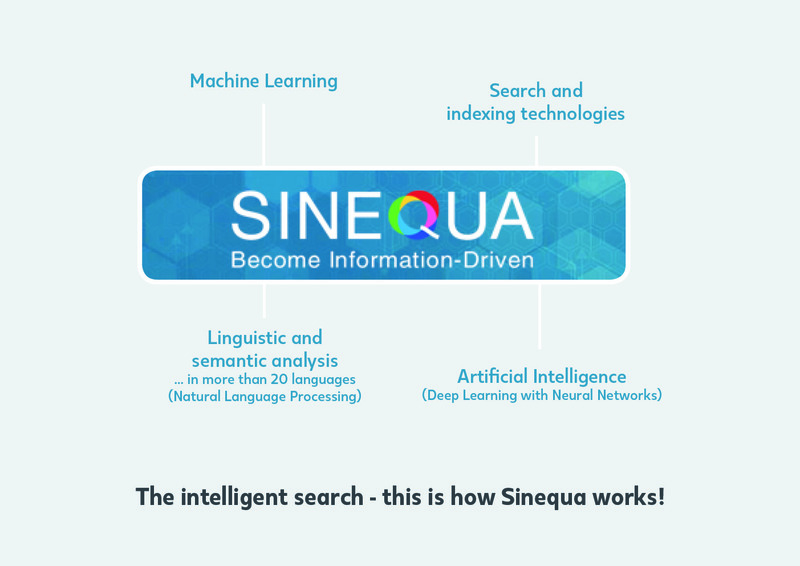 Sinequa uses a whole arsenal of technologies for this purpose: Search and indexing technology, linguistic and semantic analysis in more than 20 languages (Natural Language Processing, NLP), Machine Learning (ML) and Artificial Intelligence (Deep Learning with Neural Networks). Thus, terms and concepts are discovered in texts, related to each other and linked with other data. Sinequa combines all search and analysis technologies in such a way that they reinforce each other and are not just isolated next to each other. User feedback is also used to calculate the relevance of information. Increased relevance thanks to smart linking of contexts and areas of interest of the user. The security concepts and access rights of the original data are retained even after all analyses. Over 180 connectors for data sources from the cloud, Hadoop and on premise enterprise applications. The provision of service-relevant, correct information forms the basis for an optimized deployment of your technicians and customer advisors. With the cognitive services of SINEQUA you can easily and quickly provide exactly this information from complex data structures and documents (e.g. operating manuals, deployment reports, maintenance histories). This reduces service costs and increases customer satisfaction at the same time. The cognitive search and analysis of SINEQUA not only promotes knowledge fragments, but also uncovers connections and allows employees to make well-founded decisions and comply with company rules. Knowledge is no longer lost through generational change. Through excellent result relevance and user-oriented features, you quickly create a business search that inspires your employees. With the help of SINEQUA, data volumes from heterogeneous system landscapes can be merged with very high efficiency in a central search. This is possible economically and quickly thanks to the high connectivity and the intelligent data preparation. By combining the excellent technology of SINEQUA with the specific technical expertise of Join GmbH, we set new standards in the evolution from data-driven to information-driven companies in the region of Germany, Austria and Switzerland. Because only an understanding of the connections makes it possible to deliver the right information to the right people.